There is wonderful story told by the old Irish poets of a relationship between Oisin (OH-SHEEN), the last of the Fianna, and Patrick, the patron saint of Ireland. Oisin is presented as the final representative of Celtic pagan society and he debates religion with Patrick, who becomes his benefactor and protector. The story can be found in Irish manuscripts written in the Irish language from the turn of the second millennium. They have been beautifully translated and compiled into a book by Lady Augusta Gregory, God bless her soul, titled Gods and Fighting Men. Her work covers a great deal of material of the Tuatha De Danaan, or the fairies, and the legends of Fionn and his band of righteous fighting and hunting men. But, this piece will focus specifically on the story of Oisin, the son of Fionn MacCumhail, and Patrick, who drove all the snakes out of the beautiful land of Erin. The story begins after a great battle, in which many of the Fianna had been killed. 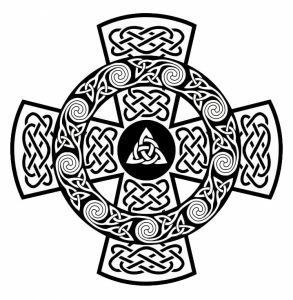 The Fianna were a noble and well-loved clan of the best of Gaelic of society. They were the most wise and beautiful, champions in fighting and poetry, the most skilled at hunting and playing chess. Their leader was Fionn son of Cumhail and Fionn had a son named Oisin. One day, a beautiful princess of Tir Na Nog came to propose marriage to Oisin because of the great name he had acquired for himself. Her name was Niamh of the Golden Head. Oisin’s reputation had carried his honour as far as Tir Na Nog, or the Land of Youth, which lay west of the ocean and is the home of the gods, where Niamh lived as the royal princess. He instantly fell in love with her, and after proclaiming his love for her she put him under the bonds of a hero. He climbed up on her horse to join her in marriage and live in the land west of the sunset. They rode west into the sea and, just as Moses had parted the waters, so did the ocean itself make a dry and safe passage for the new lovers. They started a family and had a few children and lived in happiness for many years in the Land of Youth. Until, one day, Oisin was filled with a great longing for his home and his people. So, he rode a horse back to Ireland, through the land under the sea, to find the Fianna. Before he left, his wife, Niamh, warned him that if he were to set foot on the soil of his home land all the years he had lived without aging would catch up with him and he would never be able to return. When he arrived in Ireland, he found that a great many years had passed – much more than he had felt while in that land of peace. The Fianna had only survived in the stories of the many generations which had passed, and a new religion had swept the land. In his grief he rode to a well where his companions had once gone to drink and forgot that he could not step foot on the ground. As soon as he came off his horse the centuries of age he had previously not felt withered him into an old and feeble man and his horse fled leaving him helpless and alone. Some men of the new religious leader, Patrick, found him and brought him to the monastery to be cared for. There Patrick nursed him to health, fed him, and cared for him. Much of the stories recorded of their time together consist of their theological debates about the fate of the Fianna’s souls and the goodness of a God who would condemn honest people to Hell for not having the Christian religion. It is a wonderful piece of history in that these poems were written well into the Christian era and scholars are not sure if this represents a consistent thread of sympathy among the Celts for their pagan ancestry or a resurgence of pagan appreciation after centuries of lost tradition. Either way, the reader is clearly left with sympathetic feelings towards the Fianna and some serious questions about the orthodox teaching of the Catholic church in the middle ages. Patrick reiterates the party line in his short portions of the dialogue, telling Oisin that he should forget about his former companions, as they are all suffering eternal torment in Hell, and that he should focus on repentance and baptism so that his fate will not be sealed with theirs. Oisin refuses to renounce his fallen comrades, even though he does attend mass and live in the Christian community. He also asks Patrick to pray to God on behalf of his beloved family – but Patrick refuses to be concerned with the fate of the souls of heathen men. Throughout these debates, Oisin repeatedly sings the praises of his fallen comrades. They are a beautiful mixture of things pleasing to our modern sensibilities and things which seem barbaric. The three qualities Oisin most admires in the Fianna are their honesty, generosity, and ability to kill anyone they choose. The Celtic spirit is embodied by the praise of qualities which Oisin deemed fair and worthy including: never telling lies, sharing their wealth with anyone and everyone, treating women kindly and with respect, being feared by all who would face them in battle, hunting with great skill, unmatched prowess in the game of chess, large and extravagant feasts of meat and wine, and expertise in the art of raising dogs. Oisin also makes a repeated point that Christian music, including the singing of psalms, and most especially the ringing of church bells, is nothing compared with the music of the Fianna and more importantly, the music of the natural world – of the birds and the waves. Oisin is utterly disgusted with the notion of fasting, chastity, and pious music and he longs for the life of hunting and seducing women he left behind. Most importantly, however, he makes a theological argument against the Christian religion in terms which deserve serious attention. He almost accepts the Christian tradition if it were not for one point which Patrick will not budge on. That is, the fate of souls who do not fast, and sing psalms, and live lives of chastity. Oisin argues that a god who does not have mercy on such great men as the Fianna cannot be a truly good god. He challenges Patrick by saying that Fionn would not hesitate to rescue God if he were enslaved in eternal torment – that nothing would stop the Fianna from storming Hell and closing its gates and freeing all the people imprisoned there. He says that God cannot be nearly as righteous as Fionn, as Fionn would never permit such an atrocity. Oisin could not accept a God who would condemn good righteous people to Hell simply because they did not worship a jealous god. And, frankly, neither can I. This story, however, does not paint a black and white picture, with paganism being superior to Christianity. Patrick proves himself to be a good Holy man by caring for Oisin who constantly belittles him. By working patiently and diligently to baptise Oisin for no reason other than the fate of his soul. He even asks Oisin to share his story of what the Other World was like, for both Patrick and Oisin seem to feel that Tir Na Nog and Heaven may well be the same place. Patrick proves to be patient, loving, and generous to Oisin and the story leaves one with more questions than answers about what righteousness truly means. Can a violent yet honest person be considered just? Can a person who is equally as generous with their wealth as they are with their sexuality be just? Could the Land of Youth be the same as the Kingdom of Heaven? Is there more value in pious fasting or feasting and merriment? Is one better to listen to the bells in the church or the birds in the forest? Perhaps this story is actually a reminder to those of us who have forgotten the deeds of the Fianna that the Celtic Christian tradition embodied by Patrick still nurtures and cares for a tired and weak remnant of what was once a strong culture. That with compassion the church can still house and listen to what remains of the pagan life, and care for it as it ages, and honor that its great heroes also made it to Heaven even if they called it Tir Na Nog instead. For Oisin had returned to Patrick from a life in Heaven, where he married and angel. Perhaps, when I die, I will share a meal with Fionn and Jesus and we can sing psalms and try to best each other at chess. What a boon! Your site was shared via Facebook by my church…Holy Spirit Episcopol in Missoula, MT. I intend to follow your posts..so rich and edifying. Thank you. Thank you for sharing this in our Celtic Christian Church Facebook group. I heard my Da again as I read this story.